Mistle Thrush on rowan. Photograph by Tommy Holden. The UK countryside supports large numbers of several thrush species through the winter. The Winter Thrushes Survey aims to find out more about their numbers and distribution, and the resources that they need to survive to spring and the next breeding season. This winter, please use BirdTrack instead to record all your sightings of winter thrushes, and other birds. The Winter Thrush Survey ran for two winters 2012/13 and 2013/14 and was well supported with over 24,500 visits, made by almost 2,000 observers at 4,080 different locations across the UK. The survey recorded more than 875,000 thrushes and nearly 634,000 other birds, including over half a million Starlings. Vist the Winter Thrushes Survey results to read the provisional results from the first winter. How does thrushes' use of habitats (including gardens) vary, by species, geographically and through the winter? How do feeding behaviours vary, again by species, geographically and through the winter? What is the relative importance overall of key habitats such as farmland, gardens and orchards and of the various feeding resources? 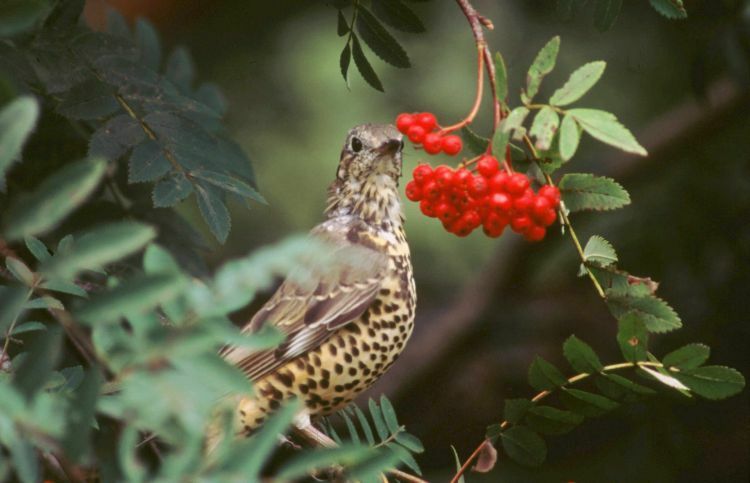 In what ways do thrush numbers, distribution and feeding behaviour differ between successive winters? The more information we can gather on these topics, the better we will be able to promote the conservation of these birds. Observers were invited to set up routes, based loosely on 1-km squares, for repeated winter walks. Locations of all thrushes observed, with their habitat and activity were to be plotted online onto a map of the survey route. Walks could be made at any time from mid September to mid April. A randomly selected set of squares had been set up for synchronised coverage in midwinter. This element of the survey is organised through the BTO's Regional Network.